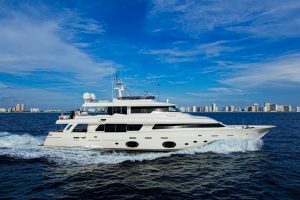 Check out the video on this used 107' Ferretti yacht for sale in Florida! : Atlantic Yacht & Ship, Inc.
A video has just been completed on the used 107′ Ferretti yacht that Joe Marino has for sale and it is a must-see! In the first place, this used 107′ Ferretti was launched in 2012. Overall, this 107′ Ferretti is a lovely Italian Tri-Deck style motor yacht and is available for sale. After all, the desirable five stateroom layout will not disappoint. Similarly, the main deck master suite is a beautiful feature. Additionally, there are crew accommodations for up to seven crew. Not to mention all the other features, upgrades, and perks! This lovely used 107′ Ferretti has the styling and quality one would expect from this reputable manufacturer. Not to mention the light Oak furnishings that make her feel tasteful and inviting. Correspondingly, the large windows combine a flood of natural light with the wood decor. After all, this lovely yacht has been built to US specifications but also features a currency converter. Furthermore, the jacuzzi on her sun deck makes for even more fun while entertaining! For more information on this beautiful used 107′ Ferretti yacht for sale be sure to contact Joe Marino today! For over 56 years Atlantic Yacht & Ship has been serving the yachting community. Our headquarter sales office is dockside at Harbour Towne Marina. Right in the heart of the yachting capital of the world, Fort Lauderdale, FL. Our in-house waterside service department provides general yacht services. This ranges from new teak, to engine rebuilds, captain services, and everything in between. Whether purchasing or marketing a quality vessel, Atlantic Yacht and Ship, Inc. is your one stop resource for the highest quality service and sales in the yachting industry today. If you are looking at yachts for sale, or thinking about selling your yacht, it is always wise to have an experienced broker representing your interests throughout the deal. Contact Atlantic Yacht & Ship at 954.921.1500 or click here.